At a time when fear of facing black flag waived by anti-Citizenship Bill protestors haunting many of the BJP leaders, ministers and MLAs in Assam, the fear has also reached Delhi. It came to light after detention of 7 protestors from Assam, who reached the national capital for waving black flag in Delhi on the Republic Day. According to information, the 7 protestors were detained by Delhi police from a hotel on Friday night, just a few hours ahead of the Republic Day celebrations. 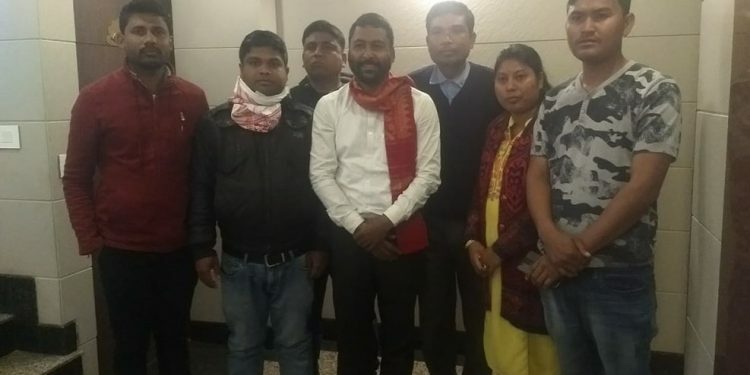 The detained activists, who are members of the 70 groups protesting against the Citizenship (Amendment) Bill, 2016, reached Delhi on January 25, 2019. On a tip-off, a team of police from Sansad Marg Police Station reached Mayur Assam hotel where the group checked in and took all of them to the police station on Friday night. However, they were released by the police after 3 pm on Saturday as the Republic Day celebrations were over. The group of activists from Assam was led by the president of Anusushit Jati Yuva Chatra Parishad, Rubul Das. The group, according to sources, was planning to waive black flags at the time of the country’s President hoisting the national tricolor, demanding scrapping of the controversial Citizenship (Amendment) Bill, 2016. But as they failed to get entry passes for the Republic Day celebration programme at Rajpath, they planned to waive black flags in front of Assam Bhavan in the national capital. Anusushit Jati Yuva Chatra Parishad president Rubul Das and the other activists have expressed strong reactions over their detention from the hotel. “The BJP government is now seriously afraid of black flags,” Rubul Das told reporters after their release from lock-up. Rubul Das also alleged that they were mentally harassed by the Sansad Marg police. He alleged, the Sansad Marg police also cautioned that the 70 groups from Assam would not be allowed to stage any kind of protest till January 31, 2019. It may be mentioned that the Citizenship (Amendment) Bill, 2016, which has been passed by Lok Sabha on January 8, 2019 is likely to be tabled in the Rajya Sabha in the next session starting from January 31. “A two-hour symbolic protest against the Citizenship Bill was supposed to be staged tomorrow. But have not been allowed to stage hunger strike at Jantar Mantar,” said Rubul Das. The other members of the detained activists are Satra Mukti Sangram Samiti’s finance secretary Hiranya Pathari; Anusushit Jati Yuva Chatra Parishad general secretary in-charge Kamala Kanta Das, member Bishnuram Hazarika, Kamrup (M) District Committee general secretary Jadav Das; Nagaon District AJYCP’s general secretary in-charge Pragjyotish Bania and Krishak Mukti Sangram Samiti’s Devajani Nath. It may be mentioned that from Assam chief minister Sarbananda Sonowal, finance minister Himanta Biswa Sarma, Assam BJP president Ranjeet Kumar Dass to MPs Pradan Baruah and Kamakhya Prasad Tasa, most of the BJP leaders have been shown black flags by protestors for their support towards the Citizenship Bill.